~ The following was published in The Floyd Press on February 12, 2009. 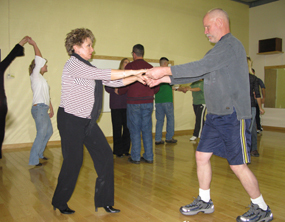 Floyd Fitness Center Manager Ellen Wright organized her first Swing Dance Class at the Winter Sun Music Hall. At that time her eldest son was a member of the Floyd County High School Band, which held yearly Jazz and Swing Dance Concerts. “They were well attended but not well danced,” Wright remembered about the events. Realizing that most of the band members didn’t know how to dance together, she enlisted the help of Christiansburg’s Sapphire Ballroom and Dance Center for a Swing Dance Class for ages fourteen and up. “It was a successful class with 30 students. Half of those were teens,” she said. 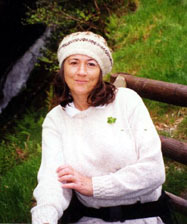 When Wright took the position as manager of the Floyd Fitness Center in the fall of 2007, she recruited the dance center once again to teach local dance classes. After the fitness center’s Grand Opening in the winter of 2008, dance classes were added to the gym’s program and began the following summer. “Everything we do is partner dance, whether it be the waltz, the fox trot, swing or salsa,” said Linda Stancill, Sapphire Dance Center owner and instructor. The dance center, which opened in the summer of 2004, offers private lessons, workshops, and group classes. They also hold events, such as the 2009 Valentine Lovers Ball, described on their webpage as a romantic evening of dining and dancing. 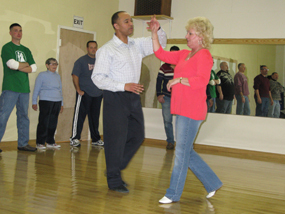 Other dances taught through the Sapphire Dance Center include Country Two-step, Ballroom Dancing, Essential Latin, Tango, Rumba, and the Carolina Shag – a swing dance style that originated in North Carolina and involves leg kicks and fancy lead-follow footwork. Based on requests, Carolina Shag classes will be offered at the Floyd Fitness Center in March, Stancill said. 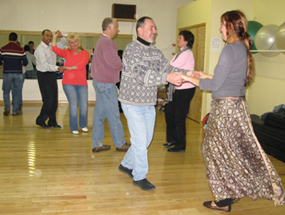 Essential Ballroom and Salsa classes are scheduled on the same night as the Carolina Shag. A Country Two-step class is slated for April. 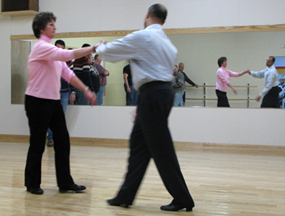 Although the dances taught at both centers are partner dances, you don’t need a partner to sign up. At Thursday’s Swing Dance Class at the Floyd Fitness Center more than twenty students were nearly evenly divided between men and women. The group of adults-of-all-ages lined up to watch instructor Dennis Williams review what was taught in previous classes before pairing up and practicing their steps to music on the classroom’s hardwood floors. The 25 x 28 foot room, which features natural light from skylights, a sound system, a ballet barre, and a walled mirror, is also used for CPR classes, Holistic Health Seminars, and is available to gym members when classes are not being conducted, Wright said. The collective mood of the Floyd Swing Class was upbeat. Students followed Williams’ instructions as he called out Spins, Hammerlocks, and Belt Turns. One of seven Sapphire Dance Center instructors, Williams has fifteen years combined dance experience in jazz, tap, hip-hip and clogging. He has participated in musicals with Summer Musical Enterprise as an actor, dancer, and choreographer and is a former lead singer of Virginia Tech’s New Virginians. Announcing to the students that he would not be available for next week’s class, Williams told the class that his fellow Sapphire dance instructor Lane Mattox would be instructing the last class of the series. He encouraged them to show off their skills to Mattox, who some were familiar with from past classes she has taught in Floyd. Dancing is fun, social, and it’s beneficial to one’s well being. It’s also a good way for couples to spend time together. A Sapphire Dance Class Gift Certificate for an upcoming class would make a nice Valentine gift, Wright suggested. Note: For more Floyd Press stories click HERE and scroll. Curious post … I’ll have to try dancing more sometime. I can run real fast due to having leg muscles that are a bit too big but those leg muscles make my feet very slow … (too much power, not enough finesse) Hurts my batting in cricket and definitely gives me two left feet. While I appreciate the art of dance, I can’t even dance my way out of a paper bag. Get one big enough for me to fit in, and I’ll prove it! By the way, NetChick sent me. (Better late than never). I used to love dancing all night when I was in college and just after. I said I’d never marry a man who didn’t dance – but guess what? I did anyway. Maybe that’s why I love watching it on TV so much nowadays! I LOVE to dance but not WITH someone. Good to see people enjoying themselves. I am a hopeless dancer, so I always stay safely behind the camera! Glad to see this happening in Floyd! This looks like fun! I love to dance and it is a good way to shed off some fat too. I told my mom to enroll herself on some ballroom dancing since she is too lazy to hit the gym. Weird. Btw, did my comment went through? Nice article! Did they run your photos too? Yes, they used all these photos and one or two others. Some of our good friends started with the small group here and are now headed to towns like Raleigh to show off their stuff. They had tried to get Martin and I to do it but no…we love to dance but aren’t really the structured type. Nor did we have the time at this point in our lives. Plus he swings me way too hard!